Do you have any food obsessions? Looking through the chapter headings of a book titled Obsessions featuring the ‘favourite foods and heartfelt passions’ of the ‘Two Fat Ladies’ (Clarissa Dickson Wright and Jennifer Paterson) there are many that strike a chord ( and some that don’t). Pasta, garlic, lemons and crab have me scouring the pages, as do mustard, parsley, olives, butter and raspberries. The tripe chapter remains an intellectual curiosity only. However, there is a glaring omission – CHEESE; it isn’t even listed in the index. The neglect of this ingredient by cooks with such gusto for flavour and robust food astonishes me. Perhaps they just enjoyed it on its own with a glass of red wine. My status as a ‘cheese-anorak’ was officially confirmed this week. Spending two hours with Ana Cerqueira at Jones the Grocer, peering into every nook and cranny of their cheese room had me leaving in a near state of nirvana. My own obsession with cheese has been coming on gradually, partly fuelled by the way the ‘cheese-scene’ is developing. Artisan cheese-makers, both those who have been following a tradition for decades or those who want to rediscover and expand this craft, seem to be thriving. However, my appreciation of really good cheese was kick-started by the opening of The Fine Cheese Co in Bath in the early 1980s. Bread-filled wicker baskets stood by the door and the air was scented by the loaves made with basil. The cheeses were (and still are) displayed on a chiller cabinet that looks like an Edwardian kitchen dresser. A wheel of Brie de Meaux sat by the till, slowly oozing towards the edge of its platter. 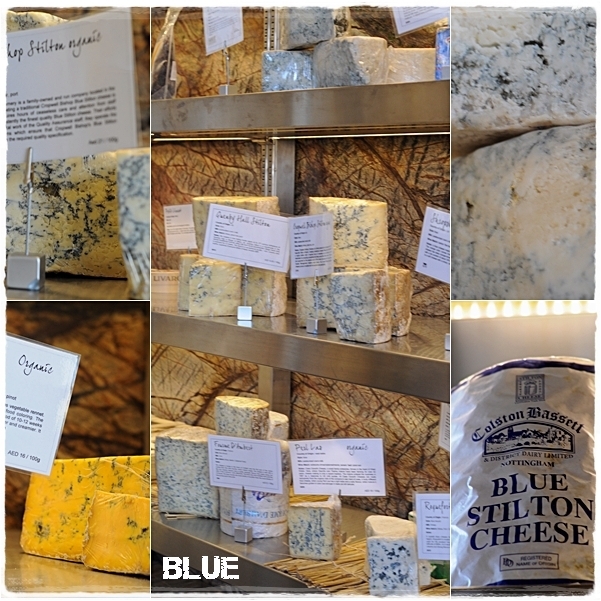 You always had to queue but once it was your turn there was no rush, Ann-Marie and team devoted their whole attention to sharing their knowledge, recommendations and genuine passion for cheese with you. Tasting was de rigeur. The business has expanded into branded biscuits and other cheese related items but the shop remains only a little bigger than it was 20 years ago including an excellent cafe. Am I a cheese snob? If this means that my heart-sinks when I pass the section of the supermarket which houses bags of shredded ‘Monteray jack’ in hues of tangerine, ‘mozzarella’ which resembles a house brick and comes from Holland, edible plastic described as ‘cheese strings’ and anything cheesey in a tube, then yes. But I’m not alone it seems given the outcry prompted by Alex James’s foray into tandoori masala ‘Cheddar‘ for Asda (yes mainly by Guardian readers, but I read the Guardian!). Jones the Grocer manages to have such a unique and eclectic range of cheeses because they import most of it from two main exporters, one French, one British; and lo and behold the UK supplier is The Fine Cheese Co. Popular cheeses can sell out quickly, I noticed that the Devon Blue had gone and apparently the new season Mont D’or had cleared in a few days. The optimum temperature for cheese storage is 8 C and our conversation kept moving from the warmth of the restaurant to the cool of the enticing cheese room. Wax paper is the idea wrapping (or the rind of the cheese itself for many) but municipality rules means that the arch-enemy of cheese – cling film – is in evidence, although they try to keep it to a minimum. Jones the Grocer trains its staff on every aspect from the production methods and origin of the cheese, how to serve the customer (including food matching suggestions) and – the best bit – tasting. Ana cut into a new truffle Reblochon that had just arrived, the middle soft and flecked with black. I’m a big fan of this washed-rind style since tasting Baronet at the Tavistock Cheese Fair and this variation was muskily addictive. Our next stop was to compare the excellent Quicke’s Cheddar with its cave-aged cousin, discussing the effect of the humidity on the taste, softening the flavour without lessening its intensity. Although you can buy this by the slice, a whole truckle costs about 300 AED (£50) and would make a fantastic centrepiece for a Christmas spread. The Quicke’s goat Cheddar is popular with local customers who also favour sheep’s milk cheeses. Cheese is supposed to have originated in the Middle East where milk was transported in the stomach of a goat, sheep or cow and the resulting effect of contact with the rennet. The local cheese on offer in supermarkets tends to be very bland but Ana and I both share a desire to discover more about the cheeses of the region. 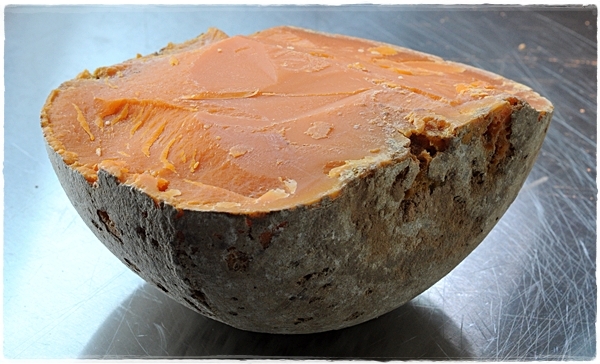 I spotted a craggy-looking ball with a pumpkin-hued interior; Mimolette, first made in France to copy Edam after Louis XIV banned the import of Dutch cheeses into France in the 17th century. Originally flavoured with carrots but now annatto, it had a slightly sweet, nutty flavour and has to be kept away from the other cheeses as its production includes the cheese mite which gives the distinctive appearance and flavour. Ana’s theory on variations in cheesemaking is that countries produce it using methods that suit their climates. So the Northern colder places have hard cheeses that take a while to mature and keep for a long time to see them through the Winter, warmer places can make softer, fresher cheeses although they need to be eaten quickly. Italians use cheese for cooking in the main, so most are either very hard (a really excellent Parmigiano Reggiano is stocked) or soft – Jones imports Burrata, buffalo mozzarella and buffalo ricotta. Manchego, from La Mancha in Spain which has cold winters, is a sheep’s cheese that is hard and dry. I confessed to finding it a bit boring although it’s nice paired with some quince paste. I was given a slice of Idiazabal, a raw sheep’s milk made in the Northern Basque region of Spain by artisan-producer Baztangoa which had a smooth, buttery, nutty flavour which immediately called for some red wine. This will be going on my cheese board. Originally from Portugal, Ana’s passion for cheese had been inspired by her Father who would often pop a slice of Emmental into her hand as she left the house. There is a tradition of cheese-making in the Azores, influenced by the Dutch including a raw milk cow’s cheese called St Jorge which goes very well with Port. It’s rare to find such knowledge and passion from a food retailer in Dubai, outside the artisan stalls at a market. After nearly two hours of cheese conversation (fromaging? ), clutching wax paper parcels, I drove home (a three-minute journey) with the sun glowing red, my obsession temporarily sated. Here’s a little tour of the cheese room from Ana. Do you have any food obsessions? Or do you just want to talk cheese with me?! Yes, it IS a good cheese room. 2 hours – lucky you! I couldn’t help it. As soon as I saw that cheese room I wanted to go in it. I invited myself! I declare this post is unfair for those of us who are cheese-lovers still in pajamas with no hope of a fresh cheese market today. Love it! I’m a great cheese fan too, although I’m not such a connoisseur. Unfortunately here we do not have artisan cheese shops(unless it is for bulgarian white brine cheese) and there are only supermarket varieties. But every time my sister comes back from France she brings us a couple of fine cheese surprises. Mmmhhh, what beautiful cheeses! I am a sucker for that kind of wonderful food. Paradise! That walk-in cheese room is definitely Jones The Grocer’s USP. Cheese heaven, lucky you! Cheese-anoraks are the best kind of anoraks there are…. such an interesting post too. This post has made me hungry. I’m off to devour a big slice of cheddar smeared with chutney. Now this is so interesting Sally. 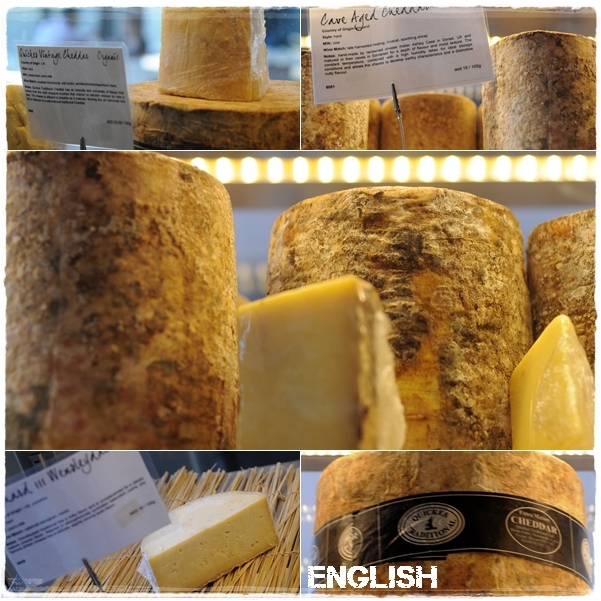 I had no idea a cheese shop would be featuring on a Dubai blog. I guess I was forgetting about air conditioning. You are so right though not to forget cheese. Love it. I’m lucky enough to have Cornish blue and Yarg cheeses both on my doorstep, but with a whole host of other great cheeses produced in Cornwall. We used to have a brilliant old fashioned deli in Liskeard called Oughs which featured all sorts of Artisan cheeses as well as local butter. Sadly, it no longer exists. Please carry on spreading the word. 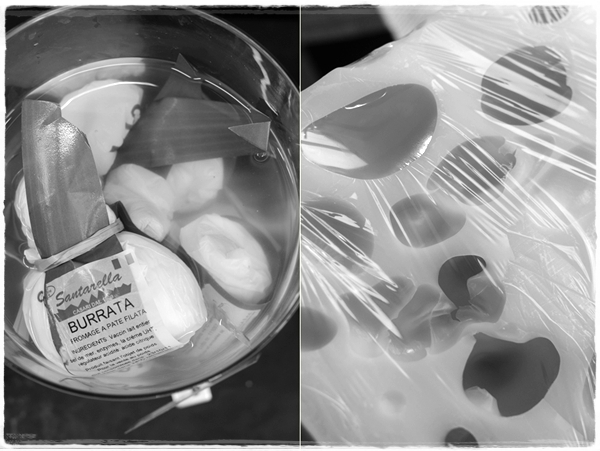 One word – Burrata! You are very, very lucky to have found someone who imports it, made in a tiny village in Italy. The cheese of the moment in London. Amazing stuff! Great post. Never visited Jone’s teh Grocer but unfortunately I’m not such a cheese snob. I’m one of those that would probably pick up those tangerine bricks from the supermarket :0 Perhaps I need a tour to educate me? 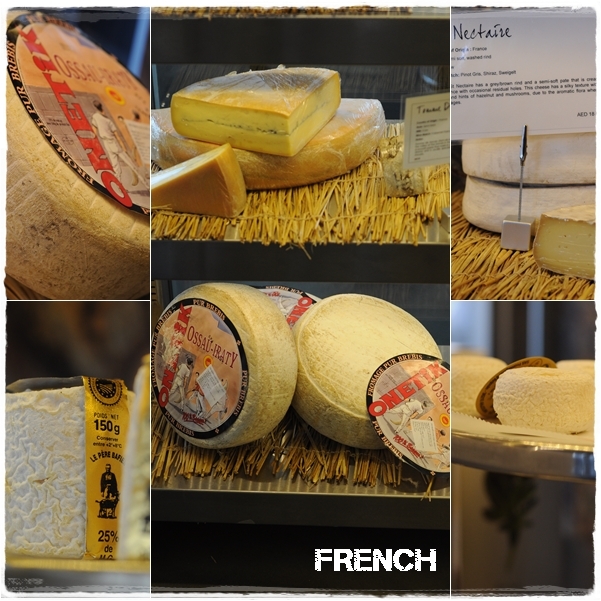 Some things its good to be a snob about, and cheese is one! I’m lucky living in Provence, where the local cheese is made with goat or sheeps’s milk, both of which I love. We can also get very good other regional cheeses in my local market, I bought a delicious Coulummiers last week, a superior Brie/Camember cheese with a pong to match! The French aren’t great at importing other cheeses (why should they they make so many?) but in the nearby town of St Remy there is a cheese cave, where you can get cheese from all over, including the cheese of the moment (I didn’t realise it was!) the Burrata, which split open, served with tomatoes and olive oil, is quite delicious and has a price to match! Tell you what, you can have my portion too, I am not a big cheese lover and have quite a simple palette to please with cheese. Mmmm, those pictures made me hungry! I agree cheese should´ve been on that list! I´m a cheese addict myself but you know the irony of it? My husband hates cheese and i hardly ever eat it because eating it in front of him spoils the whole experience…. Made me chuckle – perfer nob! I love cheese, it’s for me what chocolate is to others. When I visit a country I go home with a bag of cheese. In april I had a fitting for my wedding dress in London. I had about two hours there before I had to take ny flight home. The first stop was Neils yard dairy, I bought 7 kg of cheese I later found out when they weight my bag at the airport. It was 26 C that day and when I arrived at the dress fitting the cheese started to smell! After that I nearly missed my flight but I had my cheese! Oh I do so agree – a woman after my own heart (my suitcase is always full of cheese when I come back from the UK). Wonderful shots. 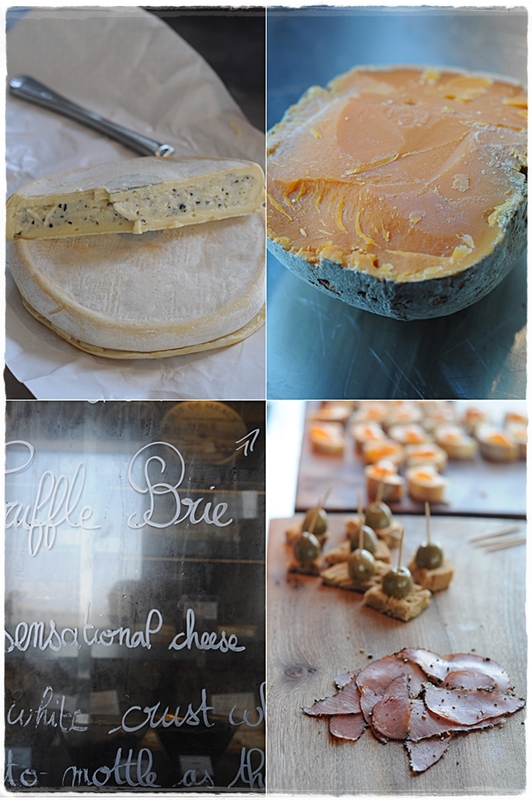 Should you ever travel to NYC, there is a fromagerie/bistro that specializes in global artisan cheese. I’ve a feeling you will take to it very nicely. Susan, Celia – how wonderful to have international cheese invitations. Maybe a cheese tour one day…? The Italian cheese lady with a stall at Ripe in Dubai Garden Centre makes a superb buratta, in Sharjah of all places. Well worth a look. Jones’ cheese room is my very next stop. We are officially off the diet and your blog made me absolutely delirious. Thanks for all the good pointers. Would like to chat with you. I write a blog about our adventures in the UAE. Ah! I wish this post had come out last week! I had hopped over to Jones last week for a cheese b’day gift. Do they give free tastings? I should have totally asked…I’m surprised at myself for not doing that. They had a truffle brie which I’m DYING to taste. Sally, please know that you are welcome to do cheese posts ANY time you are in the mood. I am salivating. As for cheese snobbery, I buy my girls organic mozzarella sticks every now and then when I think we need an easy on-the-go snack, but they usually leave 3/4 of the stick untouched (so WHY do I buy them, one wonders? ), but put some good goat cheese, a nice blue or any other quality cheese in front of them and they are asking for more! A personal favorite of ours is Manchego, raw milk, aged 4 months. It’s just perfect.